Intrigued, I set out to veganise them. Replacing the milk was easy: any plant-based milk will do. I’ve opted for hemp milk, though, as it tends to be the fattiest and therefore most similar to the Ramsay’s full-fat milk. The egg was a little trickier to substitute, but in my experiments I found that just skipping it out, and adding a little more liquid, worked absolutely fine. A couple further adjustments I made were not for veganisation reasons but for added interest. I replaced half the plain wheat flour with gram (chickpea) flour for extra authenticity; gram flour is a staple ingredient in Indian cuisine for its nutritional qualities and slightly nutty flavour. My second adjustment is carrots in the place of potatoes. 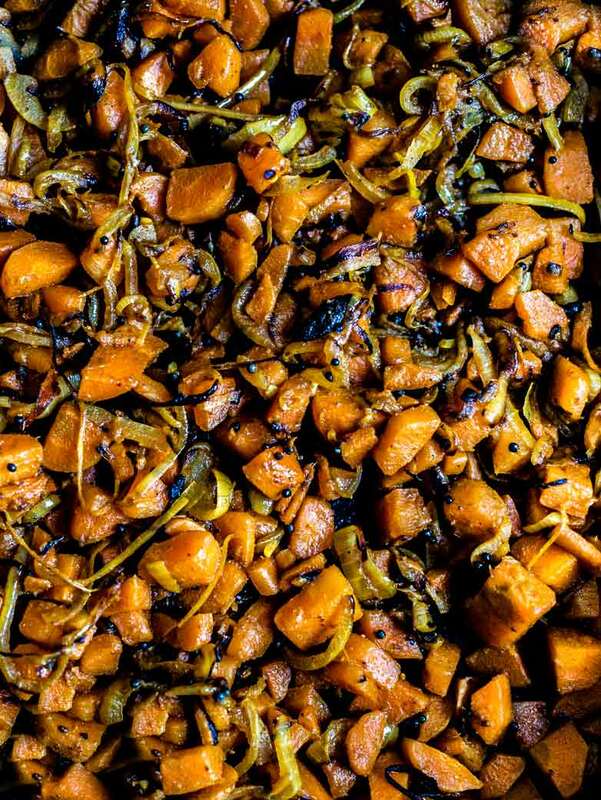 Their subtle sweetness provides welcome contrast to the other, mostly savoury, ingredients. The main reason, though, was because I wanted to lighten up the dish, as on first testing the potatoes proved one carb too many alongside the pancakes. Enjoy these pancakes on their own, or if you're feeling extra fancy, whisk up a quick vegan raita with plain soy yogurt, minced red onion, fresh coriander and salt. They'd also go well with my vegan tzatziki! 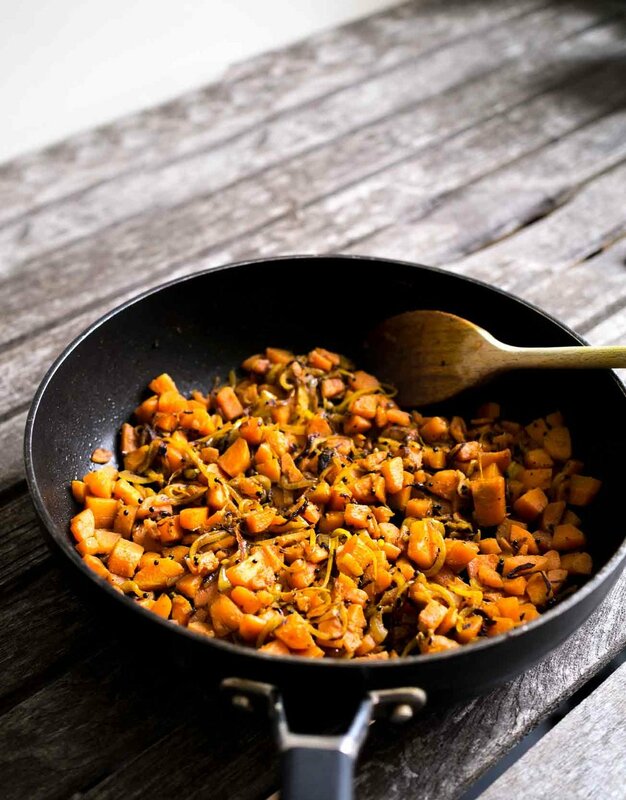 Over a medium-high heat, dry-toast the cumin seeds in a medium frying pan for 1-2 minutes until aromatic. Add 1½ tsp oil to the pan along with the chilli, garlic and ginger. Fry for 2 minutes, then remove from the heat. Transfer this mixture to a bowl. Don't wash up the frying pan - it will be used again. In a medium pot boil the carrots for 5 minutes, then drain and rinse with cold water to stop them cooking. In the same frying pan as before, heat 4 tsp oil over a med-high heat. Fry the mustard seeds for 1-2 minutes. When they start to pop, add the sliced onion and fry for 3 minutes. Stir in the turmeric and fry for 3 more minutes. Add the boiled carrots to the frying pan and fry for 4 minutes, stirring so they're well coated. Set aside. For the pancakes, sift the plain and chickpea flours into a medium mixing bowl. Stir in the salt, pepper and fried chilli, garlic and ginger. Pour in a third of the milk and gently whisk it in to the flour. Pour another third in and whisk again, followed by the last of the milk, until you have a smooth, runny consistency. Leave the batter to rest for 10 minutes. In a good non-stick, wide frying pan, heat ½ tsp oil over a medium-high heat. Pour in 100ml (a little less than ½ a cup) batter and tilt the pan to spread out the batter. Leave the pancake to cook for between 90 seconds and 2 minutes, lifting the edges with a spatula to check it's not burning. It should be golden brown and crisp. Flip the pancake and cook for a further minute. Transfer to a warm plate and cover with a tea towel (dish cloth) to keep warm while you cook the other pancakes. Alternatively, keep warm in an oven on low. Place a serving spoonful of the carrots in a line to one side of a pancake. 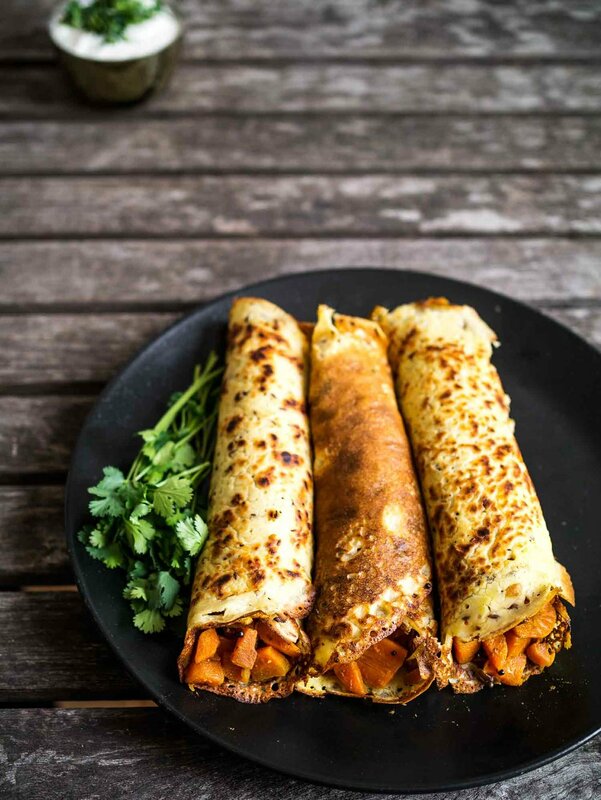 Roll the pancake up around the line of carrots. Repeat with the other three pancakes and serve.